Yesterday was another Hanukkah Pizza Night hosted by my friend Alla. Crusts, tomato sauce, varieties of cheese and toppings, abound, all you really needed was your imagination and extra oven space. 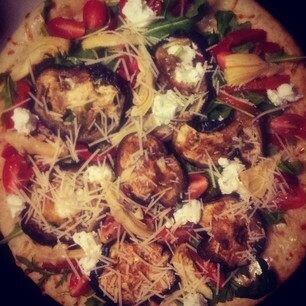 This year, I went vegetarian route with Roasted Vegetable and Ricotta Pizza. The combination of toppings is pretty flexible to fit your tastes, but I would advice against tomato sauce and too much cheese. You really want to taste the vegetables. I grilled slices of eggplant but took the shortcut of buying roasted red bell peppers. Feel free to roast your own, if you wish. 2. Spread olive oil over the crust and sprinkle with half Parmesan cheese. 3. Top the cheese with arugula and dollop with ricotta cheese. 4. Lay eggplant slices over dollops of ricotta cheese. 5. 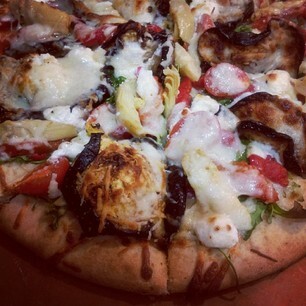 Arrange peppers, tomatoes, and artichoke hearts over the pizza and sprinkle with the remaining Parmesan cheese. 6. Bake directly on the oven rack for 10-12 minutes, until cheese is melted and the crust is crisp. 7. Cool slightly before slicing. This was really fresh and delicious. I would sprinkle the baked pizza with fresh basil and a handful of red pepper flakes.